Louisiana iris wildflower; photo by 澎湖小雲雀 on Flickr (noncommercial use permitted with attribution / share alike). The iris has sword-like foliage and grows to 5 or 6 feet. 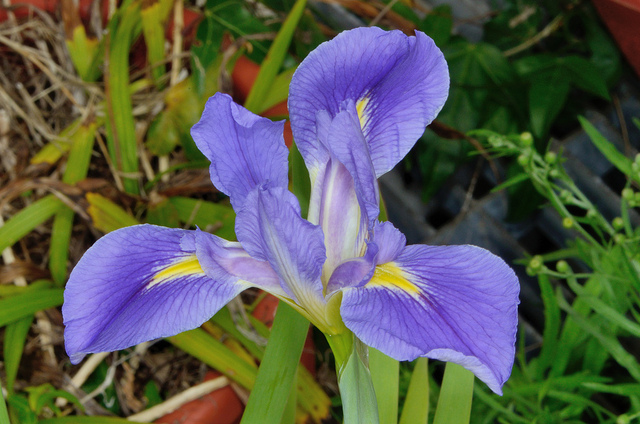 It has a wider color range than any other iris (blue, purple, yellow, pink, white, and shades of brownish-red). The Louisiana iris grows wild mostly in marshy locations in coastal Louisiana, and for about 100 miles inland, but also adapts to almost any climate and is popular as an ornamental flower. The great abundance of wild iris blooming in the spring has been an inspiration for artists in New Orleans. The official symbol of Louisiana is the fleur-de-lis; a stylized iris used in decoration and as a heraldic symbol. 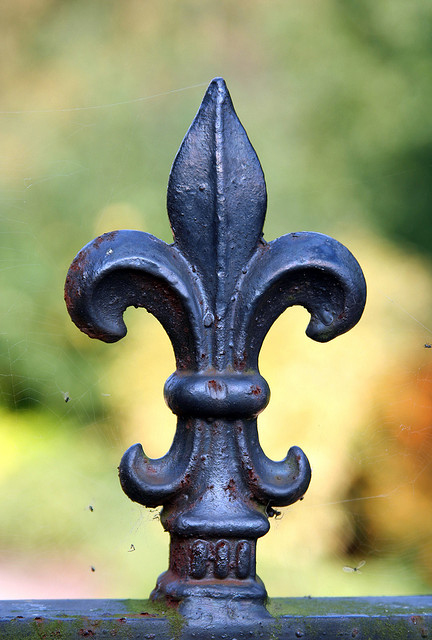 Fleur-de-lis design on wrought-iron fence post; photo by LEOL30 on Flickr (noncommercial use permitted with attribution / share alike).